Dr. Danuta “Danka” Kasprzyk and Dr. Daniel Montano are professors in the Department of Family and Child Nursing and the Department of Global Health. Social psychologists by training, they are experts in research on health-related behavior change. 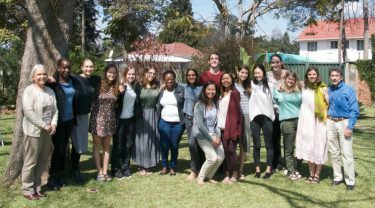 Last summer, Kasprzyk and Montano led a group of 13 UW undergraduate students on a four-week, twelve credit study abroad course in Zimbabwe, Honors Zimbabwe: Population Health in Action – Research and Implementation in Zimbabwe. The course focuses on population health in Zimbabwe, with experiences related to health care policy, health care services, community outreach and implementation science. Students receive lectures from professors at the University of Zimbabwe and leaders in the Ministry of Health. Students spend a week with a provincial medical directorate learning about health care policy and evidence-based implementation with visits to district hospitals and rural health centers. They also spend a week in a rural hospital, and spend time with Zichire’s behavior change implementation teams. After completing their PhDs, Drs. Kasprzyk and Montano returned to Kasprzyk’s birth country, Zimbabwe in 1983. At the time, the HIV epidemic was only in the beginning stages. While a case of HIV had not yet been formally diagnosed in Zimbabwe, they spoke with a national tuberculosis specialist who was instrumental in forming the TB-control program in the 1940s, and who was observing an increase in TB cases due to compromised immune systems. This conversation was the catalyst that led Kasprzyk and Montaño to seek funding for research on HIV prevention in Zimbabwe. Kasprzyk and Montano obtained their first grant to work on HIV prevention in Zimbabwe in the 1990’s. They have had continuous funding for research in the country since 2000, in collaboration with the University of Zimbabwe Zichire Program and the Zimbabwe Ministry of Health. Currently, they are examining factors that affect men’s motivation to get circumcised for HIV prevention in Zimbabwe. Working with a graphic designer, they developed posters on circumcision based on their research. They tested the posters with students at the University of Zimbabwe, and found significant change in targeted key beliefs and motivation. With funding from the U.S. Centers for Disease Control and Prevention, they are currently testing their messages among a community-based sample of men in Zimbabwe. Yvette Rodriguez is a second year Ph.D. student in Nursing Science. Originally from San Antonio, Texas, she chose to become a nurse after spending five years working in a veterinary hospital. The knowledge and skills she gained working with animal health, combined with nursing, have fostered her interest in the area of One Health. According to the Centers for Disease Control and Prevention (CDC), One Health recognizes that the health of people is connected to the health of animals and the environment. One Health encourages the collaborative efforts of multiple disciplines-working locally, nationally, and globally-to achieve the best health for people, animals, and our environment. 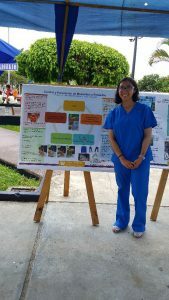 Rodriguez initially sparked her passion for global One Health at Texas A&M, while studying Chagas disease, a parasite found in many countries of South America. She was familiar with the disease as she treated dogs for the very same disease at her local veterinary hospital. In Spring 2017, she was selected to spend five weeks in Iquitos, Peru as part of the Global2Local (G2L) scholars program. Her experience was made possible by a generous gift from Jeb Wyman and support from the Hegyvary Citizens of the World Scholarship. Alongside another UW G2L Nursing scholar, Rodriguez worked with a multidisciplinary team comprised of Nursing, Medicine, Landscape Architecture, Civil Engineering, and Dentistry colleagues, to identify and design improvements in the built environment to an informal settlement called Calverito. The Nursing G2L scholars specifically worked to design and test a methodology to assess trash accumulation within the informal community. The aim of the project was to assess trash accumulation and determine how is may facilitate community interaction with potential vectors of disease, such as mosquitoes, or reservoir species, such as wildlife, for zoonotic diseases, building on her interest in One Health. The scholars designed a small survey to determine what health impact these trash accumulations could have on Claverito and began development of interventions to address these risks together with colleagues from La Universidad Nacional de la Amazonia Peruana Universidad de Amazonas (UNAP) School of Nursing. The invaluable experiences Rodriguez gained in Peru, included being able to participate in a local environmental health fair where she developed and presented posters and pamphlets on topics such as food safety, water safety, hand washing, and parasite prevention. On three occasions, she observed the local vaccine clinic to learn more about the hospital operations. In addition to interacting with community members, she formed relationships with other professionals engaged in the project including architects, biologists and ornithologists, and began building a professional network with nursing faculty and nursing students from UNAP. Since returning to Seattle, Rodriguez has begun her next G2L Scholars project, working to translate the findings of the work in Claverito to homeless/housing insecure communities in Seattle. Improving data quality across three sub-Saharan African Countries Using the Consolidated Framework for Implementation Research (CFIR): Results from the African Health Initiative. Gimbel S, Mwanza M, Nisingizwe MP, Michel C, Hirschorn L, et al. Maternal Tenofovir Disoproxil Fumarate Use During Pregnancy Is Not Associated With Adverse Perinatal Outcomes Among HIV-infected East African Women: A Prospective Study. Pintye J, Baeten JM, Celum C, Mugo N, Ngure K, Were E, Bukusi EA, John-Stewart G, Heffron RA. Mixed-Method Evaluation of Social Media-Based Tools and Traditional Strategies to Recruit High-Risk and Hard-to-Reach Populations into an HIV Prevention Intervention Study. Iribarren SJ, Ghazzawi A, Sheinfil AZ, Frasca T, Brown W 3rd, Lopez-Rios J, Rael CT, Balán IC, Crespo R, Dolezal C, Giguere R, Carballo-Diéguez A. 26th Annual Principles of STD/HIV Research Course: The UW Department of Global Health and Center for AIDS and STD will be offering a two week cross-disciplinary training course in STD and HIV research fundamentals. The course will be held July 23-August 2, 2018 at the University of Washington. Applications are currently being accepted. Learn more. Sichuan University International Nursing Student Summer Camp: Sichuan University will be hosting its annual summer camp for nursing students. Students will take classes and participate in clinical observations. The program runs July 8-July 21st, 2018. For more information and an application please contact HDau@uw.edu. Thursday, Feb. 1: Center for Global Health Nursing scholarship applications open. Learn more. Tuesday, Feb. 6: Brown Bag Seminar with Jillian Pintye and Abby Link in the School of Nursing conference room, T-332. The topic is HIV Prevention for Adolescent Girls and Young Women in Kenya. Mark your calendar. Tuesday, Feb. 27: Brown Bag Seminar with Nora Kenworthy in the School of Nursing conference room, T-332. The topic is Mistreated: therapeutic successes and democratic deficits in the fight against AIDS in Lesotho. Mark your calendar. Friday, March 2: Center for Global Health Nursing Scholarship applications deadline. Learn more.